From the Cumberland Gap to the Atlantic Ocean, this is Virginia Water Radio for the week of September 16, 2013. This week, we feature another series of mystery sounds. Have a listen for about a minute, and see if you can guess what water-based Virginia state park was the location of these sounds. And here’s a hint: if you think long enough, you’ll be on the right track. If you guessed the New River Trail State Park, you’re right! 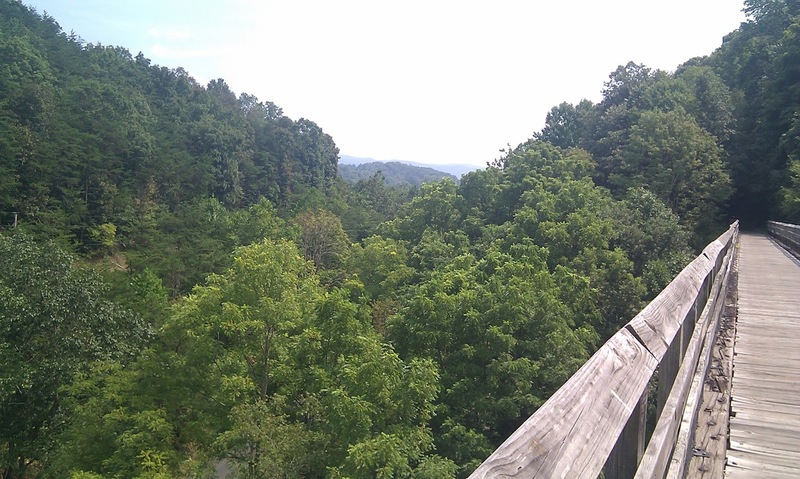 Walkers, bikers, and horseback-riders encounter the sounds and sights of insects, birds, farms, trains, boats, and more along this 57-mile linear park, the longest in Virginia’s state park system. The park lies on a railroad bed and right-of-way donated to the Commonwealth in 1986 by the Norfolk Southern Railway company. The rail-line’s development adjacent to the New River built upon the river’s historic role as a transportation corridor and site for settlement and industries. 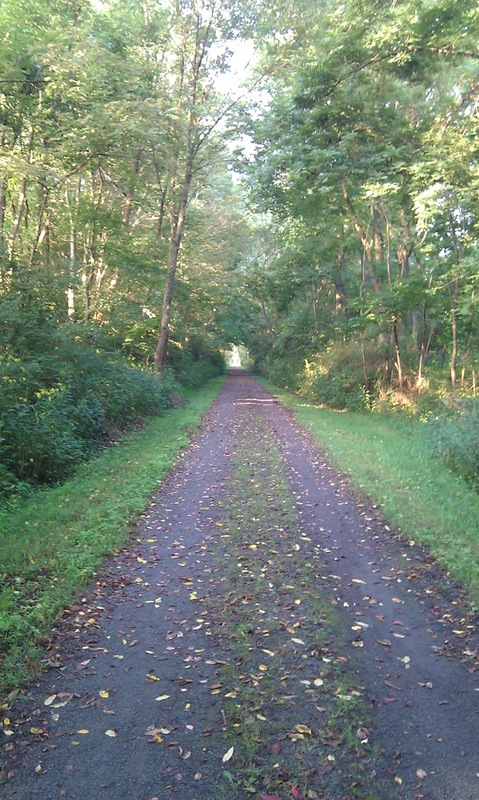 Across Virginia, over 30 trails are located on or near former railroad beds. Many of those trails give today’s travelers on foot, two-wheels, or living horses (not the iron kind) a way to have a long listen and look at Virginia’s waterways and their landscapes. View along the New River State Park Trail near Draper, Virginia (Pulaski County), August 31, 2013. View looking southeast from the New River State Park Trail between Draper and Hiwassee, Virginia, August 31, 2013. 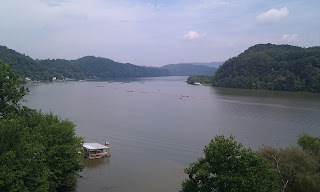 Upper section of Claytor Lake (a hydroelectric-power impoundment on the New River) viewed from the New River State Park Trail, August 31, 2013. 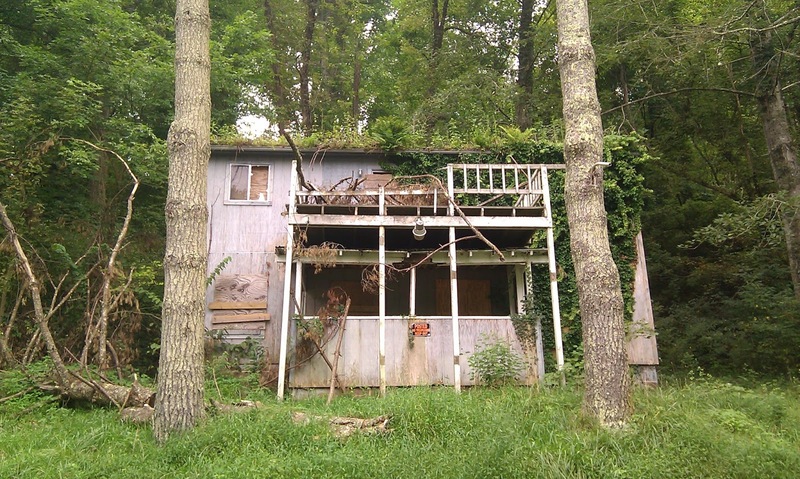 Days gone by: an abandoned house along the New River State Park Trail near Hiwassee, Virginia, August 31, 2013. Acknowledgments: Eli Heilker helped compile information on the New River Trail State Park for this episode as part of Virginia Tech English Department internship in fall 2013 with the Virginia Water Resources Research Center. This episode’s sounds were recorded August 31, 2013, during a 22-mile walk along the New River Trail State Park in Pulaski County and the Dora Road Trail that runs along Peak Creek (a New River tributary) from the town of Pulaski to the state park. 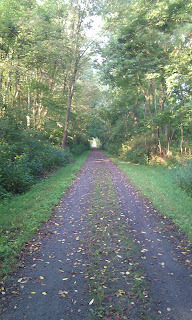 “New River Trail,” Virginia Department of Conservation & Recreation, http://www.dcr.virginia.gov/state_parks/new.shtml. New River Trail,” by Clayton Hensley, Knoxville News Sentinel, August 3, 2013, accessed at http://www.knoxnews.com/news/2013/aug/03/vacations-close-to-home-history-rides-alongside/, 9/16/13. 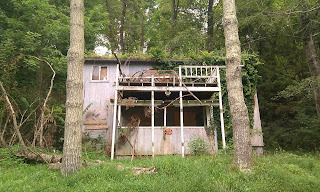 “Virginia Home to Many Rails-to-Trails,” Virginia Bicycling Federation, http://www.vabike.org/virginia-rails-to-trails/.